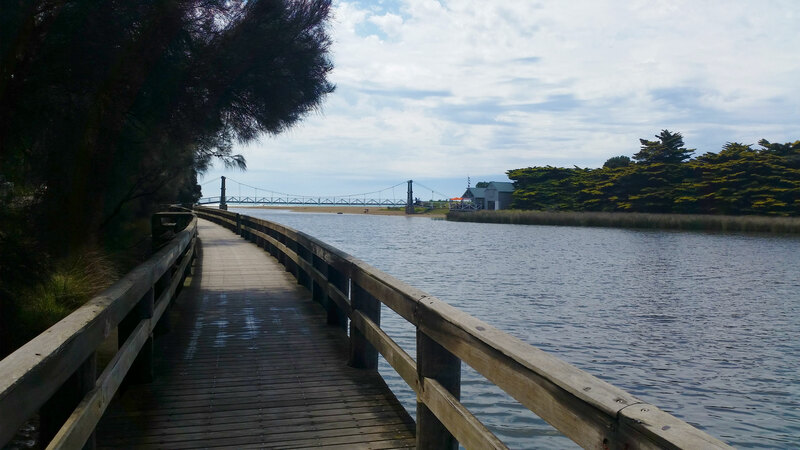 The board walk and Lorne Swing Bridge. ‘It looks like it’s full of Ghosts’, I proclaimed as we amble home past a dark old house with huge pillars and wide shadowy balconies. I say these things a lot, much to the dismay of my friend, who can’t understand how a self-declared non believer comes out with totally contradictory comments like this. Turns out in the light of day the house is a lot less scary, being just one of many impressive old house you pass on the walk between the Lorne Township and the beautiful Grand Pacific Hotel. 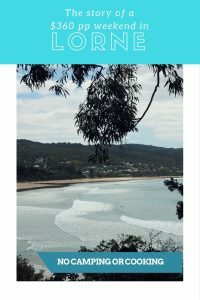 Lorne, a waterfront town only a two hour drive from Melbourne , is one of the Great Ocean Roads most spectacular and popular towns but in recent years it’s developed a reputation for being rather expensive. Having been given a voucher for the Grand Pacific hotel for Christmas but failing to save prior to departure, I decided to see if we could make it through the weekend without cooking and drink in hand for our $250. My $300 voucher covered everything except $30 of the brand spanking new Pacific Queen Deluxe room and you can even pick up the more budget double for $260 in total for a two night weekend during most times of the year. The Hotel looks and feels exactly as its name sounds – a grand old building overlooking the ocean and the Lorne Pier. It’s a combination of new and old and the original part of the building has been there long enough to stand witness the opening of the Great Ocean road in 1922. There are tables and chairs for all guests to use on the shared wide old balcony’s, so you can skip the ocean view room to save cash and sit out there beer in hand with a free waterfront view. 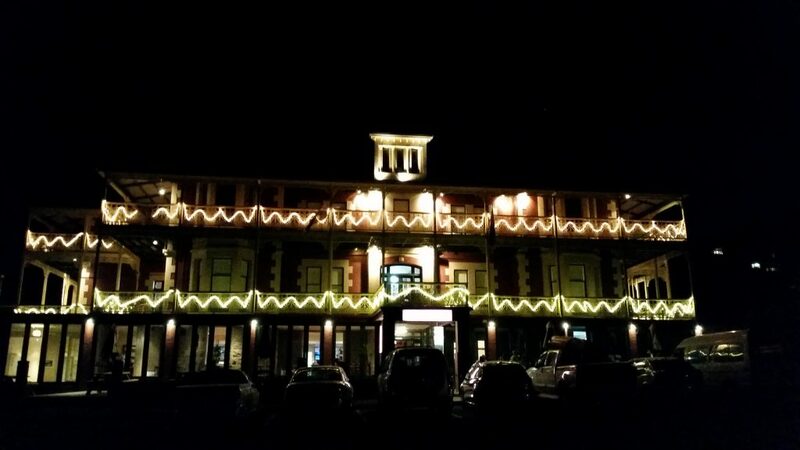 The Grand Pacific Hotel in Lorne all lit up at night. This hotel is the perfect place to stay as long as you don’t mind the short 1km walk into town and the ‘cosy feel’ of their more budget rooms (they also have spacious rooms like the Spa King). The effort will often save you well over a $150 for the weekend compared to big name hotels in town and for those on a budget like us that is a lot of food and beer money! Dinner Friday night was at the atmospheric Saporitalia, an authentic Italian restaurant near the river on the Lorne side of the bridge. It’s a great place to unwind into the weekend drink in hand and it’s open late for those arriving from Melbourne. Though we decided to start our weekend with a bang, with wines, pizzas and pasta, it still came in under $90 and you can share a $23 pizza for a budget option. Saturday morning it was absolutely pouring so well fell out the door laughing at our bad luck like a scene from a movie and skipped the walk in favour of a very short drive to town. We decided to test out our new theory, that since both of us are usually to full by the end of a cooked breakfast, we may be able to get a gourmet breakfast at budget prices by sharing the ‘big breakfast’ and adding a couple of sides. We got a beautiful meal at Bottle of Milk (a restaurant that calls both Torquay and Lorne home) and with large double shot coffees it still came in at around $36 in total, a heap cheaper than the usual $50 plus breakfast spend. We filled in some time to the pouring rain passed by visiting the well-stocked book shop and then the Information Centre which has a brand new exhibition on the Great Ocean road. I already knew that the road was hand built by soldiers returning from the war but the video and photo footage of the process and stories from the soldiers gave me a whole new appreciation for the magnificent coastal road. 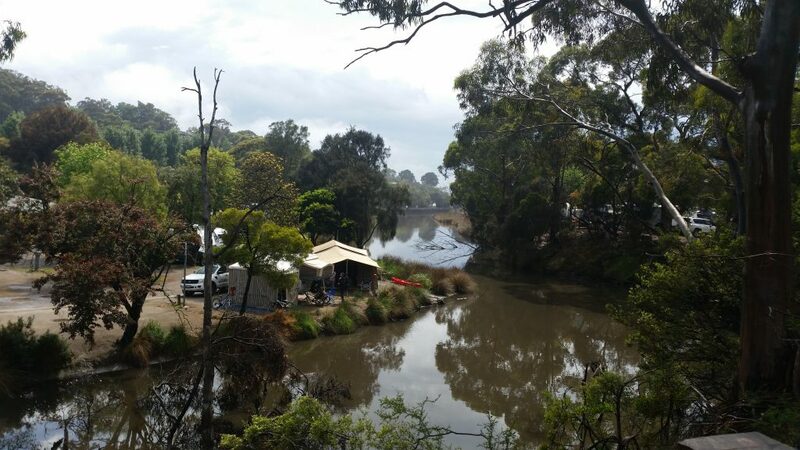 Magically, while inside the centre, the rain stopped and by the time we did the loop walk along the river boardwalk, jumped like a 10 year old along the swing bridge and landed on the beach, the sun was blazing and water was sparkling. Since the river is known to offer up a catch of the occasional decent size Bream we returned with our rods and a mid-morning coffee. Despite my poor fishing skills and it being a less than ideal time of day to fish it was still a good excuse to laze about in the sun until lunchtime called. I find it impossible to pass up the chance to eat somewhere with a view so we got in early at the very busy Lorne Beach Pavilion. Its full most days for a reason, with beautiful fresh food served with a side of million dollar beach views by fun staff you could only describe as ‘characters’. We were also pretty excited to spot a sign declaring a three hour afternoon happy hour from 3-6pm. After indulging in some mid-afternoon beers on our hotel balcony we made our way back for happy hour. 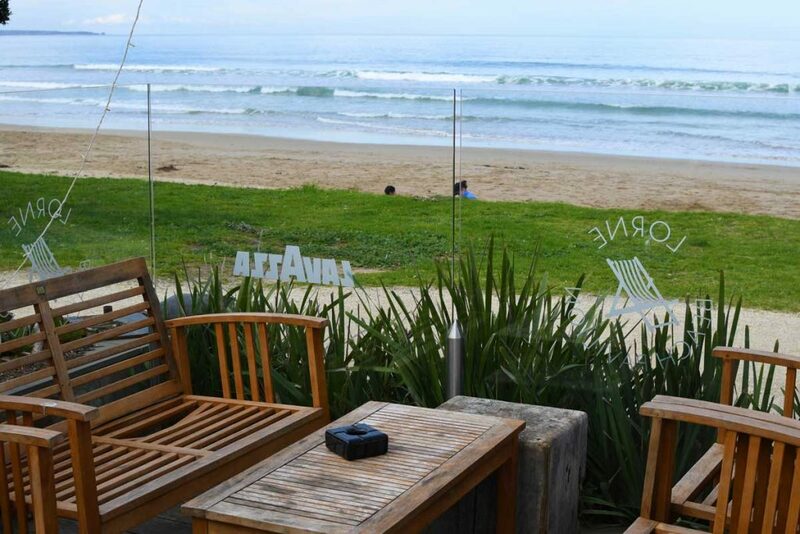 This is the best value happy hour going round with ocean front wooden tables, outdoor music and I kid you not – $6 pints of Furphy, the beer brewed by little creatures as a thank you to the people of the Geelong region for their support. It was the same bargain price for wine and $10 pre-mixed cocktails so we didn’t move for several hours, content to enjoy the sun, beach and bargain priced drinks! Dinner was back in the beer garden at our hotel (if you don’t like spectacular ocean views then this isn’t the holiday for you) and we shared an entrée and main, which meant all our food and a round of drinks came in under $50. Despite our best after dinner efforts at a fish off the pier our hooks remained empty so I bailed early and finished the evening with dessert at the outdoor pier restaurant. Breakfast the next morning was a cheap one from the bakery but the cash we saved went to a good cause. We took the long way home along the winding, and arguably most scenic, section of the great ocean road and returned via Forrest. Like the rest of our weekend Forrest thankfully turned out to be ghost free but it was home our last stop of the trip, the Forrest Brewery. It’s small craft beer haven and we enjoyed a gourmet lunch and a beer tasting platter before begrudgingly continuing on the road back to reality! Total spend $718 or $354.50 per person. Minus our voucher this was $168 over our somewhat unrealistic budget that had to go onto the credit card. Absolutely. Share more meals or reduce it down further to $319.50* per person with the double room option. Or perhaps consider drinking less than we did………. In a nutshell $319.50 works out at about around 16 hours work for a casual retail employee so get saving! Prices there start from a modest $145 a night (2017 prices) most weekends of the year and you can walk off some of the food on the way there and back. 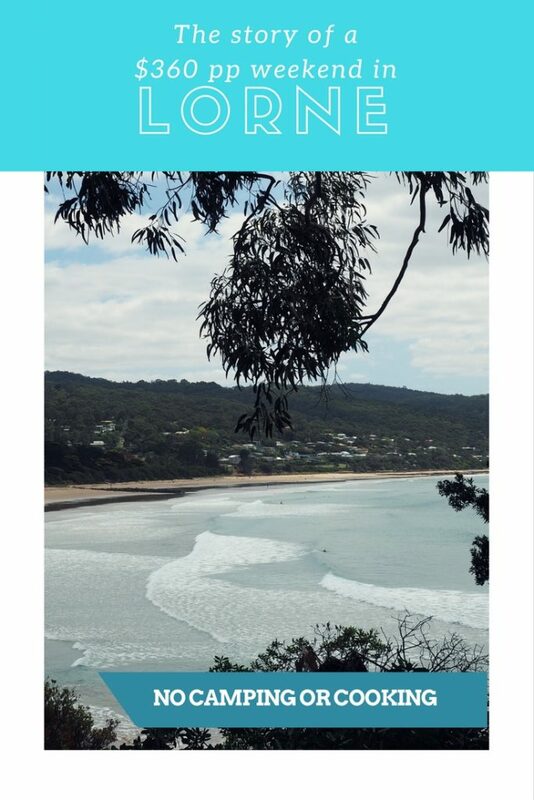 PIN A WEEKEND IN LORNE TO HELP PLAN YOU TRIP!